We made it to Ashley's dorm room! Last weekend, I drove my oldest daughter to college. It was a long drive and it was raining. My daughter, tired from a week of late nights, quickly went to sleep. It was a deep sleep; she was snoring! I thought about how much trust that requires. There are certain people who, no matter how tired I am, I could not sleep while they are driving. 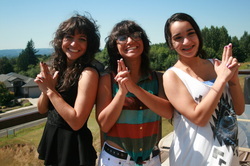 Afterall, my life is in their hands! My daughter could rest peacefully because she knew that I would drive safely and that I had directions and a map. I would get her to her destination. We did have one minor problem. The pressure in my tires was low. I pulled off and explained to Ashley the dangers of driving with the tires not properly inflated. She agreed that we should stop and take care of the problem rather than continuing on our journey simply speeding toward our destination. That entire scenario made me contemplate my relationship with Christ. Do I trust him enough to let him take the driver's seat? Do I trust that he knows how to get me to my destination so much so that I can relax and simply enjoy the ride? It's not to say that there won't be any troubles along the way even with Christ at the wheel but I know he will guide me in how to handle them. 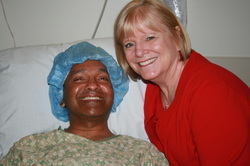 Linda with Akhil prior to his surgery. If you find yourself facing a giant in life like ALS, you no doubt will hear people say, "If you need anything, just call me." How many of us feel comfortable doing that though? 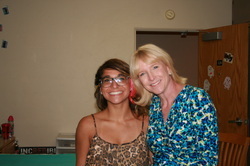 That's why I am thankful for people like my sister, Linda. She is a difference-maker. People who truly are difference makers look for opportunities to act; they don't wait to be asked. Akhil had been on the fence for some time about getting a feeding tube. I was encouraging him to get one now even though he doesn't need to use it simply because his breathing is compromised and if it continues to decline, having any sort of surgery would not be an option. I felt having the tube was simply giving him an option of whether or not to receive nutrition should he not be able to swallow at some point. On July 22 while at the ALS clinic, he agreed to have the procedure done. The staff there worked quickly to schedule a consultation with a surgeon but we were unable to get in for the consult until the end of August. Worried that with so much time to think, Akhil would change his mind, we tried to come up with a better plan. The week of July 29th, Akhil's doctor decided we could skip the consult and schedule the procedure directly so we got it on the calendar for the following week! No time for Akhil to change his mind! Akhil was nervous about the procedure. He called my sister, Linda, who is a nurse by education on Thursday, August 1st. He told her he wished she lived next door to us because she would take good care of him (I guess he thought I wouldn't). Linda reassured him that he would be fine and they wrapped up their call. Linda didn't wait for Akhil to ask her to come, she just booked a flight to be with him. Friday she rearranged her work schedule as a hospital executive for the following week so she could be with Akhil Monday. Some inconvenience and a very expensive plane ticket later and she was here to comfort Akhil and put his mind at ease without him having to ask. We so appreciate Linda hearing the "I need you" between the lines of conversation and taking the initiative to be there for Akhil. It is wonderful to have a person in your life that will look for ways to give and help without having to be asked. That is the mark of a true difference-maker. A plane ride to help a friend may not be in your budget but there are probably other things you can do to make a difference in the life of a suffering friend. Often times one who is struggling simply needs to feel that they are not alone. A coffee date, a meal or a simple "I am thinking of you" note or phone call may be just what they need. If you notice their yard needs attention, don't wait to be asked, just offer to take care of it. Look around and see how you can help. 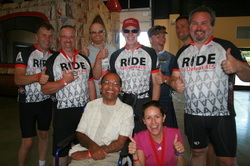 In our website about The Walk to Defeat ALS, we set a big fundraising goal because we are difference-making people. We want everyone to strive to be difference-makers, not just with a little ripple but by churning up a tidal wave! If you have a struggling friend, vow to be a difference-maker in their life. It will not only affect them but I guarantee it will make a difference in your life too. Generosity is not something that comes naturally to us. 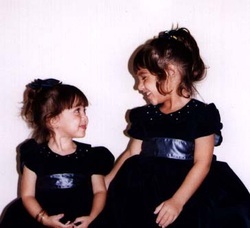 I recall a time when Corinne was a little less than two years old and Ashley was almost four. Ashley had a favorite lovey – a Lion King slipper, Simba, to be precise. She liked to rub her nose with the fur tail and I suppose it tickled. Ashley was required to leave her slipper in her bed because if it was lost somewhere in the house a search party would have to be called out at bedtime. We had already lost the mate to the Simba slipper even though Ashley never actually wore them. One day, Corinne managed to get into Ashley’s bed and take the slipper. She was sitting on the floor of Ashley’s room rubbing her nose with the tail of Ashley’s beloved Simba slipper just as she had seen her sister do hundreds of times. When Ashley found Corinne with her special Simba, the cat-fight ensued over the slipper. By the time I entered the room, tears were streaming and tempers were rising as Ashley attempted to get the slipper away from Corinne while Corinne evaded her all the while shouting, “Mine!” If you have ever been around toddlers, I am sure you have witnessed a similar scene. The interesting thing about the above scenario is that the slipper was not Corinne’s even though she staked claim to it. Ashley had the opportunity to be generous by allowing Corinne to enjoy her slipper for just a few minutes after which, I am sure Corinne would have lost interest and moved on to something else abandoning the slipper in her pursuit. Since Ashley was staking claim on the slipper, Corinne chose to cling to it all the more tightly. I find that intriguing because it tends to parallel our behavior relating to our resources and time. We stake claim to them even though they are gifts from God that He desires us to use generously. When someone is in need of our time or resources, we tend to cling to them a little more tightly perhaps questioning, “Do they really need that?”. We are taught to be generous first by simply learning to share. Then as we get older, sharing expands to generosity as we are taught to give all of something away – like the last chocolate chip cookie. Some of us get stuck at the sharing level (I'll split it with you) and we continue having a hard time being truly generous (you can have it all). Generosity is an area I am continuing to grow in. I see that God wants me to grow in this area by the people he has placed in my life right now and through the situations I am in. We need help right now and a lot of it! God has put people in our lives who are joyful and generous givers of their time and resources. I am so thankful for their example of generosity. I am learning to be a more generous giver thanks to them. I pray that someday when my time is more my own to give away and when I have more financial resources, I will remember how it felt to be the recipient of such generous giving so I will be inclined not to cling to my possessions and shout, “Mine!” but to quietly relinquish them knowing the joy they will bring someone else. Watch for my next blog posting when I will give you the opportunity to be generous! Think , “Walk to Defeat ALS”. Vows and Marriage and ALS, Oh My! We made a commitment, not to our own happiness, but to each other, to God and to all in attendance that we would stay married no matter the circumstances. We took the vows seriously and hope to live by example for our children that marriage is forever. This might hit a nerve with some of you reading this but surprisingly, marriage is not about our own happiness. 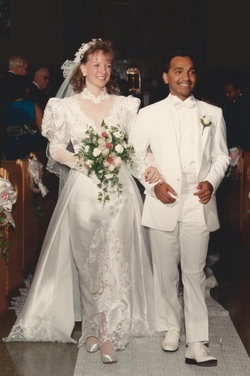 There was nothing in my vows about staying with Akhil as long as he made me happy. In the traditional vows, there is nothing reciprocal, only a promise to stay no matter what. I am not sure where the notion came from that marriage is temporary lasting only as long as one partner meets the other’s expectations and needs. That is not a commitmment, it's an exchange. We live in a media-infested society that forces images upon us of the “perfect” mate and “ideal” life. We are convinced that we are entitled to be with the perfect mate even if we are less than ideal ourselves. We need to live life a certain way and anything less than that and we cannot be satisfied. I am thankful I married a man who did not succumb to these falsehoods. The grass is always appears greener somewhere else. The key word being: appears. My advice: It is best not to look in that direction! Me concentrating on a game-winning free throw shot. When I was in school, I loved the thrill of competing in anything athletic – volleyball, basketball, track, and tennis. I was fortunate to go to a large school so we had pretty good teams for all sports. We usually entered the playing field expecting to win. There would be those rare times though when the opponent we faced was formidable; we knew they were bigger and better than we were. Even though we knew the odds were against us, we put our game face on and put forth our best effort hoping and praying that a miracle would occur and we would win. Sometimes, we did! ALS is the formidable opponent on the playing field of my life right now. I know the odds are against us but every day we put our game face on and walk on the field once again hoping and praying that by some miracle we will experience a victory. Some days we do! Some days Akhil insists that he is functioning better than the day before whether he feels he is speaking better or able to walk better we graciously accept the victory. Some days we suffer defeat in the form of a new physical challenge that wasn’t there the day before. No matter how the day before went, we enter the field again the next day with our fighting spirit ready to take on the challenge. When facing an ominous opponent, there are a couple of choices: we can concede to defeat before the action even begins or we can confront our opponent courageously and have hope that things may be different than the odds or experts, or our friends suggest. We can easily grasp that slim chance of hope because we have an amazing, powerful God that is with us during every moment. When the Israelites were about to go into battle, the priest would come forward and address the army. He would say: “Hear, Israel: Today you are going into battle against your enemies. Do not be fainthearted or afraid; do not panic or be terrified by them. For the Lord your God is the one who goes with you to fight for you against your enemies to give you victory.” Deuteronomy 20:3-4 When we face ALS each day, we need to have the same attitude as the Israelites. We cannot be afraid; if we allow fear to fill our minds then there is no room for faith. We need to enter the playing field just as we did as confident young athletes, knowing our team is bigger and better than any opponent we face. Our athletic coach and cheerleaders have been replaced by the Holy Spirit and God. They are on the field with us guiding us and cheering us on; one way or another leading us to victory.